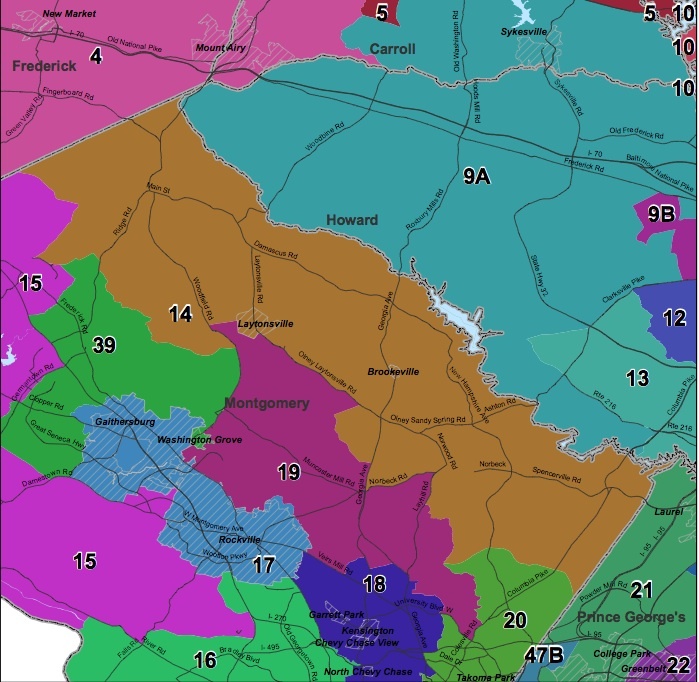 Today kicks off a series of reports on fundraising in MoCo’s state legislative districts. Incumbents are marked in red. This is by far the easiest MoCo state legislative race to figure out. All four incumbents – Senator Craig Zucker and Delegates Anne Kaiser, Eric Luedtke and Pam Queen – are going to be reelected. The end. Senator Brian Feldman has achieved every politician’s dream: a complete deterrence of credible competition. Since he first won a House seat in 2002, he has never been at risk of losing an election. Meanwhile, four of his MoCo Senate colleagues (Cheryl Kagan, Rich Madaleno, Roger Manno and Nancy King) have endured tough races in recent years to gain or hold their seats. Will any serious candidate ever run against him? Of course, your author would be the first to sing Feldman’s praises as a public official and any challenger stupid enough to run would lose, but – dang it – Feldman is not doing his part to keep political bloggers busy! Incumbent Delegates Kathleen Dumais and David Fraser-Hidalgo will be reelected despite their somewhat anemic fundraising. Of the candidates seeking to succeed Delegate Aruna Miller, who is running for Congress, Montgomery County Assistant Chief Administrative Officer Lily Qi looks like the strongest contender. Your author worked with Qi during his time in county government and found her to be smart, competent and forward-thinking. She was one of the uncommon people who could deal with the day-to-day tribulations of working for the county while also possessing the capacity to assume a perspective from 30,000 feet. Qi has done well at raising money, and with her standing in the local Chinese-American community, her admirers in the business community and the support of her boss, County Executive Ike Leggett, she has had a good start. Kevin Mack, who is Congressman John Delaney’s constituent service lead, is well regarded by those who have interacted with him and is the principal alternative to Qi. But it’s not helpful that he trailed political consultant Andy VanWye in fundraising. Hamza Khan, who switched from the District 39 House race, has not yet filed his campaign finance report and is being fined by the Board of Elections. Republicans were once competitive in this district and held a Delegate seat here as recently as 2006, but they will not win any seats in the age of Trump. The Big Question: will the incumbents slate with Qi as they slated with Miller, then a new candidate, in 2010? If they do, this race will probably be over. The District 14 delegation have made it crystal clear that they prefer that the Montgomery County Democratic Central Committee select Pam Queen for the vacancy in their district. In particular, they highlight that Queen would be the first African-American women from Montgomery to vote in the House. The subtext is also that failure to appoint Queen would reduce the number of women in the General Assembly from prior to Sen. Karen Montgomery’s retirement. Currently, three of eight senators from Montgomery County are women, as are 8 of 23 delegates. We would again like to thank each of you for your service to the party and for taking so seriously the important task of choosing a new Delegate in District 14. A number of Central Committee members have asked for our rationale in choosing to support Pam Queen for the open Delegate seat, and we wanted to be sure to provide it prior to your upcoming meeting. Our recommendation was based on a number of factors. First and foremost, we are confident that Pam shares our values as Democrats. She is and has always been pro-choice, and will stand with the Democratic Party in opposing Republican attacks on women’s reproductive rights in Annapolis. In this era where inequality is such an important topic, we know that Pam will work with us to pass our middle class agenda, including efforts to strengthen pay equity laws and address the growing student loan debt crisis. And we are confident that given her background in finance, she will be able to help us combat any attempts by the administration to undercut funding for urban jurisdictions in the state budget. But our support is about more than issues. Those of us who serve in Annapolis face a tremendously complex task. As individuals in a legislature made up of nearly 200 people, the ability to work effectively with others and get along with others is an absolute necessity. Pam has that ability, and we believe she would be a good fit for our very tight-knit team. In addition, given the need for Democrats to unite against increased partisanship in Annapolis, we need legislators who are able to work effectively with Democrats who hail from other parts of the state. Pam has worked in Baltimore for a number of years, and has pre-existing relationships with a number of elected officials there. This includes the Vice Chairman of the Ways and Means Committee, with whom she taught for a number of years until his retirement. Finally, and importantly as well, we hope to retain the gender balance that has been a feature of our delegation since District 14 was first drawn as a Montgomery County district in 2002. And we hope to see Pam become the first African-American woman to ever cast a vote on behalf of Montgomery County in the state legislature (while Karen Britto was the first to serve, it was for a brief time and she was not able to cast a vote during it). While all of us work hard on behalf of women and work to address issues of race and racism that have been too easily ignored by too many in politics, it is undeniably important that Montgomery County’s delegation to Annapolis become more diverse in terms of both race and gender. Each of us has repeatedly used our influence to endorse diverse candidates in elections, and we do so again in endorsing Pam for this appointment. An appointment like this is difficult, and we know you are burdened by the responsibility of choosing an effective leader on behalf of the 122,000 residents of District 14. We share that sense of responsibility every single day we represent our constituents in Annapolis. And we are certain that Pam Queen would be the best choice to stand beside us. MONTGOMERY COUNTY, Md. (December 4, 2015) – Earlier today, State Senator and District 14 member Karen Montgomery announced that she will retire upon the appointment of her successor, saying that she will notify Senate President Thomas V. Mike Miller Jr. on January 1 of her intent to resign. The District 14 delegates, Majority Leader Anne Kaiser, Craig Zucker and Eric Luedtke, want to thank Karen Montgomery for her leadership, dedication and commitment to a career serving Montgomery County and the State of Maryland. To fulfill the vacancy that will be created by her retirement, Sen. Montgomery has recommended Del. Zucker as her successor. After Sen. Montgomery’s letter of resignation is received by Senate President Miller, the Montgomery County Democratic Central Committee will have up to 30 days to submit a name to the Governor to serve as the next District 14 Senator. Although she will submit her intent to resign on January 1, Montgomery will continue to serve her constituents, and will not vacate her seat, until a new senator is appointed. Del. Zucker, who was first elected to represent District 14 in 2010 and re-elected in 2014, serves on the House of Delegates Appropriations Committee, where he is Chair of the Health and Human Resources Subcommittee. Del. Zucker will also have the support of County Executive Isiah Leggett. If Del. Zucker is recommended and there is a vacancy for his current seat, the District 14 Team is recommending longtime community activist, educator and Montgomery County Democratic Central Committee member, Pamela Queen. Pamela Queen is a Professor of Finance at Morgan State University in Baltimore. She uses her expertise and training as a certified project management professional and her Ph.D. in finance to enhance operations of non-profit, community and civic groups. A mother of one, Pamela is married to Retired Naval Captain Gregory Queen and lives in Olney. The Montgomery County Democratic Central Committee is scheduled to meet on January 12, 2016. ANNAPOLIS, MD – House Speaker Michael E. Busch today announced his first round of leadership appointments following the 2014 general election. Speaker Busch describes the group collectively as “the right additions to the existing House leadership team to help move us forward into the coming term.” He adds, “We are fortunate to have such a talented group of individuals to help lead the House.” Speaker Busch plans to announce additional leadership appointments and committee moves in the coming weeks. Delegate Adrienne Jones (Baltimore County, D10) will remain Speaker Pro Tem and will now oversee State higher education policy as Chairman of the Education and Economic Development Subcommittee in the Appropriations Committee. Delegate Jones was Busch’s first appointment as a newly elected Speaker in 2003. Said Speaker Busch, “Delegate Jones is one of the most versatile leaders in the House. She is a consensus builder and an extremely hard worker. With job growth and economic development at the forefront of our agenda in the coming term, I can think of no better person to lead on policy and budget issues related to our system of higher education.” Delegate Jones will also continue to serve as the Chairman of the Capital Budget Subcommittee. Having served as an instrumental member of the Ways and Means Committee since 2003 and as the Chair of the Education Subcommittee since 2007, Delegate Anne R. Kaiser (Montgomery County, D14) has been appointed as the Majority Leader. Delegate Kaiser will also maintain her roles on the Ways and Means Committee. “Anne Kaiser has worked tirelessly for the House Democratic Caucus and demonstrated leadership capabilities on crucial legislative priorities,” said Speaker Busch. Delegate Marvin Holmes (Prince George’s County, D23B) will become Chairman of the Joint Committee on Legislative Ethics. Delegate Holmes has been a member of the House since 2003 and has served in a number of leadership roles. “Delegate Holmes is a model public servant and a person of great integrity. He is the clear choice to Chair this important committee,” said Speaker Busch. Progressive Neighbors, an organization originally formed to support the candidacy of Sen. Jamie Raskin, now has a separate life of its own and says that it endorses candidates in four of the eight Montgomery County legislative districts: 14, 18, 19, and 20. However, most elected officials are just not interested. Only two of the four Senate incumbents bothered to return PN’s questionnaires, including Sen. Raskin. Among the nine delegate incumbents, just three responded. If the organization was the NRA or Marylanders for Life, this would not be shocking. But Progressive Neighbors aspires to be an endorsement that Democratic candidates covet. Indeed, they made repeated efforts to get electeds to submit questionnaires. We are writing to inform you that the Progressive Neighbors Steering Committee did not vote to recommend an endorsement of your candidacy to our membership in the June 2014 Primary election for House of Delegates Legislative District 14. Per our bylaws, endorsements must be reviewed by the membership and reaffirmed by the Steering Committee after member review. That process is beginning now with a mailing to our membership, and we believe it more considerate that you hear of our actions directly from us, rather than indirectly. Thanks for your email. I must admit that I am a little confused by it, and would hate for you to inadvertently misinform your members. I find it curious that you mention that you have “carefully considered” my questionnaire: I did not submit one for your consideration. I am a proud progressive, who in my 12 years in office has been on the vanguard of the progressive movement in the State of Maryland. I have been a key leader on issues including: making the Dream Act a reality, supporting tougher gun laws, raising the minimum wage, promoting transgender and marriage equality, repealing the death penalty, advocating for clean energy and the protection of our bay. I am a passionate supporter of our unionized brothers and sisters and fiercely fought for their collective bargaining rights. As a member of the Ways & Means committee I have worked tirelessly to make our tax code fairer for all and as chair of the Education Subcommittee, I have advocated and promoted policies to enhance our nation leading K-12 system. I hope that you’ll carefully consider the points that I have made when communicating my position, more honestly, to your members. In District 14, Sen. Karen Montgomery is currently unopposed for a second term. Sen. Montgomery served two terms in the House of Delegates before knocking out incumbent Sen. Rona Kramer in one of 2010’s top-tier Democratic primaries. On the House side, Dels. Eric Luedtke and Craig Zucker are also seeking second terms, while senior delegation member Del. Anne Kaiser is running for a fourth term. The four incumbents in the General Assembly are hanging together and have formed a slate that will campaign and do coordinated mailings. The issues that most concern him are civil rights and government transparency. “I don’t think we have enough transparency in the slightest,” he said. Evans said he is reluctant to single out one civil right to focus on. “We’ve had the gun issue, with assault weapons, and we’ve had issues with the [National Security Agency],” he said. Evans said gun laws should be based on guns’ functionality, not whether they look like assault weapons. Those topics have been “a driving force” behind his decision to announce his candidacy, he said. I think our government is not treating our civil rights with the respect they deserve. It’s time someone “stands his ground” to solemnly defend our civil rights. I want to do my part to protect our inalienable rights. I want to be there on the ground floor to say, “No, we cannot violate the people like that”, before a bill ever becomes a law. I want to be the first line of defense and give our community a strong and active voice. “Stands his ground” sounds more like George Zimmerman than John Lewis. In the Sentinel, Evans made more explicit his opposition to Maryland’s new gun laws on Second Amendment grounds. A member of the Snowden generation, it will be interesting to hear more about how Evans plans to rein in the NSA from Annapolis. The delegates are comparatively well positioned financially if not incredibly flush based on their last pre-session bank balances with Del. Kaiser at $36K, Del. Luedtke at $26K, Del. Zucker at $42K. Sen. Montgomery has $43K (error corrected from previous version). All four incumbents are solid liberals and I’d be shocked if they did not collect the usual round of endorsements from unions and progressive groups. Evans seems most likely to gain support from Free State DINOs, a group encouraging Republicans to register to vote in Democratic primaries to unseat incumbents like Montgomery, Kaiser, Luedtke, and Zucker for supporting the gun laws adopted by Maryland in the wake of Newtown shootings. John Paul Evans is a frequent flyer in the Maryland Judicial Database due to traffic offenses but none contributed to an accident. He drove on a suspended license in 2009 at the age of 19. The prosecutors declined to prosecute and did the same when Evans repeated the offense in 2011. In 2012, he plead guilty to driving without proper vehicle plates. Just last year, Evans plead guilty to failure to display his license when demanded by a police officer and still lacking the proper plates. The latter appeared related to continued problems with a suspended license. These problems strike me as not life disqualifying from public service but it would be nice if they were further in the rear view mirror. Regardless, the easy choice for Democrats is to go with the incumbents. They should win easily in any case but face a more vigorous challenge in the general election. Though District 14 has more Republicans than most Montgomery districts, effective campaigns should assure victory in that race too.